"Crystal" for the purpose of this resume refers to quartz crystal. Anytime, anywhere, anybody talks about anything, I always wonder, is this person qualified to discuss this subject? I offer this resume only to reveal the tracks of my past. Fortunately, I was introduced to crystals from a scientific standpoint. Thus, I learned how, why and what crystals do before I became aware of the "woo woo" surrounding them. I am very, very passionate about the crystal world and crystal business. A crystal is a wonderful friend, helper etc. They, although not having outward human characteristics, are another species we share this planet with. 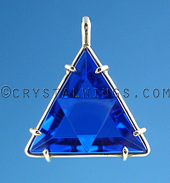 A crystal is a steady helpmate and compassionate friend on your spiritual walk. Together, you open dimensions to many unseen worlds. Nothing is more important than ones spiritual walk. Please, walk with power and self-responsibility. Every step taken in life should be full of fun and adventure. A dealer with knowledge and experience is a tremendous asset in bringing mystical stones to this walk. I consider it a sacred trust. With you, and of course, with my higher self. This resume cannot show the knowledge I realized on my hands and knees tracking a bear, watching a mother deer nurse her fawn, the times I have held a crystal until it glows or what comes to me as I wander in nature. Nature is truly the greatest of healers. I, as anyone spending time in Nature, have had many seemingly mystical experiences. But, these are for my personal growth, not for discussion or to be used to impress. A mentor of mine is fond of saying "One never becomes a Shaman, you just spend your life studying to be one." Crystals are my world. I see and feel them on several levels. They contain many, many unseen veils humans are just beginning to penetrate. 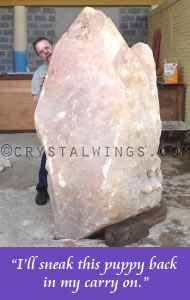 On this planet alone, over the last 26 years, searching for the unusual in crystal, I have traveled many thousands of miles examining thousands of stones. By "feeling" a crystal I often know it's origin on the planet, it's age in millions of years relative to other crystals from other places and sometimes how it lay in Mother Earth previous to being mined. 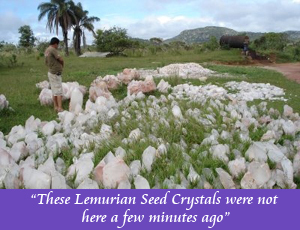 I attend several gem and mineral shows each year, travel to Brazil and other mining areas consulting with a network of miners, dealers, healers, shamen, psychics, etc. worldwide. My store has crystals and other stones from Arkansas, Utah, Brazil, China, Madagascar, Ural Mountains, Afghanistan, Mexico, Peru, Colombia, Tibet, i.e. every known type from this planet, and even a few from off planet. I choose only the most exciting, exceptional stones. 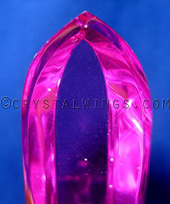 You will notice our crystals are exceedingly clear and "feel" really great and loving. Like humans, the more love given to them, the more they glow, returning that love. 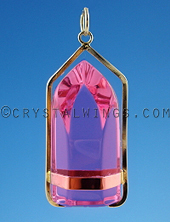 I use the crystals I sell in my own endeavors and/or healing practice. And, hopefully, I am clear on this, any information I give about crystals is from hard won personal knowledge, not a channeling, rumor, or latest fad. Weeell.....enough about me..."Going to be long in town"? 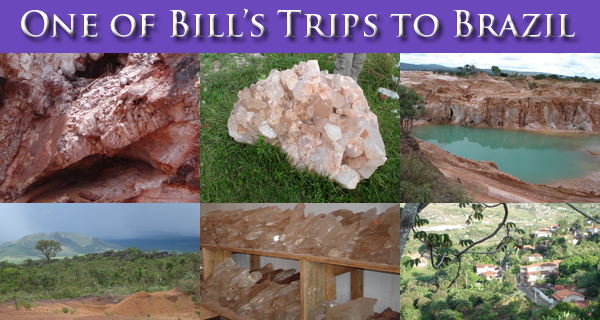 To contact Bill, email him at crystalwgs@jps.net. Bobbye Hall - Absent or distant healing and journeying. Met Marcel Vogel at a Texas seminar sponsored by Bobbye. Marcel introduces me to my first Vogel crystal. I immediately ask him to cut me a four sided healing wand and a four sided meditation piece. Sun Bear- Chippewa Medicine Man - Vision Quested, pipe, etc. Beginning of Shamanic studies. Marcel Vogel- Certified by Marcel in Vogel crystal healing and spiritual extraction techniques. 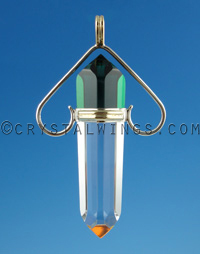 Have used and taught the "Vogel" healing/extraction method and sold vogel crystals since then. Marcel invites me to work with him at Psychic Research Inc. in San Jose, Ca. Due to divorce, closing of my business in Texas etc. I think "cool" and move to "La La land" Ca. ( to a Texas cowboy steeped in redneck traditions anyway ). Hung around the center a few days, decided research was boring, said goodbye. My wandering footsteps led me to Mt. Shasta, Ca. I'm still here. All my ex's remain in Texas. Tom Brown, Jr. - Wilderness living with nature: The key here is living WITH nature. Developing your physical survival skills allows you to relax and realize from within, that you really are one with Mother Earth. The Four Winds Society with Alberto Villoldo, Ph.D.
A. Reading the Signs of Destiny - Shamanic Divination and "seeing"